Doug Ford is a wonderful example of why the Veterans Category exists for entry into the World Golf Hall of Fame & Museum. 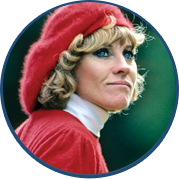 Ford may not be the first player remembered from the era of Hogan, Snead and Palmer. Still, when you look at his numbers, entry into the Hall of Fame seems quite natural. Despite not turning pro until he was 27 years of age, Ford created a lasting impression on the PGA TOUR and the Champions Tour in its early years. 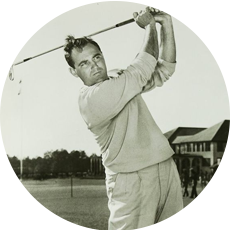 Born in West Haven, CT, on Aug. 6, 1922, Ford enjoyed his amateur years in the game after World War II. He eventually joined the TOUR in 1949 and collected his first win at the 1952 Jacksonville Open. Ford ended his career with 19 wins, including two major championships. "If you want to be a good tournament player, you've got to learn to handle the heat. The only way to prepare for that is to play for your own dough. You play for an amount you can barely afford to lose." The first of those came in the 1955 PGA Championship. In those days the PGA Championship was contested at match play. Utilizing some the skills he learned playing in high-stakes amateur games, his head-to-head talents served him well as he defeated Cary Middlecoff in the title match. It was an intriguing final match pairing Ford, among the fastest players the game has known, vs. a methodical one in Middlecoff. In the end, Ford emerged on top by a 4&3 margin. 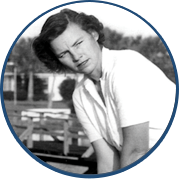 Ford was also the medalist in the qualifying for that event and it made him one of only four players in history to earn medalist honors and eventually win the tournament. The 1955 season was a brilliant one for Ford as he won three times and collected 20 top-10 finishes. He was named the Player of the Year for his efforts. Two years later Ford added to his resume with a three-stroke victory over Sam Snead in the Masters. In his youth, Ford spent a lot of time in pool rooms around New York and became as sharp with a pool cue as he was with a golf club. Ford said he used his knowledge of both in executing a brilliant bunker shot on the final hole, sinking a near impossible shot from a plugged lie. 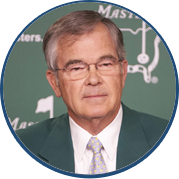 It earned him a green jacket and a lifetime exemption into the event. He put that exemption to good use, becoming a fixture at Augusta. He played in the Masters a then-record 49 times before Arnold Palmer eventually eclipsed the mark. Doug Ford is also a member of the Connecticut Golf Hall of Fame and the National Italian American Sports Hall of Fame. 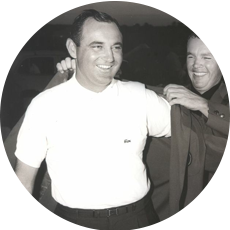 Ford nearly repeated as Masters champion in 1958, finishing just a single stroke behind Palmer. That stroke was all that prevented Ford from becoming the first player in Masters history to win back-to-back titles. His 1957 season was perhaps even better than his 1955 campaign – he again won three times, but this time collected a whopping 24 top-10 finishes. Ford continued to win on an annual basis through the 1963 season, including such prestigious events as the Los Angeles Open, the Western Open, the Canadian Open and the Bing Crosby National Pro-Am. 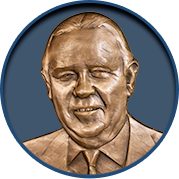 Along the way, Ford competed in four Ryder Cup competitions, using his legendary short game to help the U.S. side to three victories. While a powerful man, it was his skill from 125 yards and in that made him one of the top players of his time. 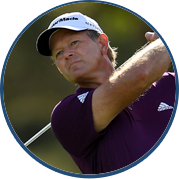 Always looking for a chance to compete, Ford won twice on the now Champions Tour at the Liberty Mutual Legends of Golf, winning in 1987 with Jerry Barber as his partner and again in 1996 with Art Wall. Ford competed in the 2011 Liberty Mutual Legends of Golf for a record 34th time, where he teamed with Billy Maxwell in the Demaret Division. Ford’s greatness was further affirmed when the PGA TOUR commissioned a study in 1989 to rank the greatest players of all-time. Ford finished 18th. 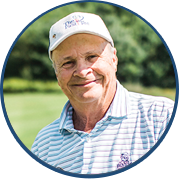 The son of a golf professional, Ford, whose original name was Fortunato, has been inducted into the National Italian American Sports Hall of Fame as well as the PGA Hall of Fame for his accomplishments.